Have you ever, while stuck in traffic, looked upwards and thought: now there's enough space to get me where I need to be? That's one. Two. Have you ever speculated: if my electric car would not weigh 20-30 times as much as I do, it could do with a lot lighter battery pack? Range would be better too. The curious thing is that established OEMs are slow to respond. The good thing is: now 'others' can step up to the plate. Since 1. and 2. are pretty much related, there's an interesting window of opportunity to act upon them simultaneously. What you're about to read, may be seen as nothing less than an industrial strategy. The helicopter has never been as successful in terms of widespread use, popularity and sales, as other 20th-century modes of transport, despite its obvious advantages. Would you believe that helicopter sales (bought new for the purpose of carrying people, both private as well as corporate) are well below 500 each year, worldwide? 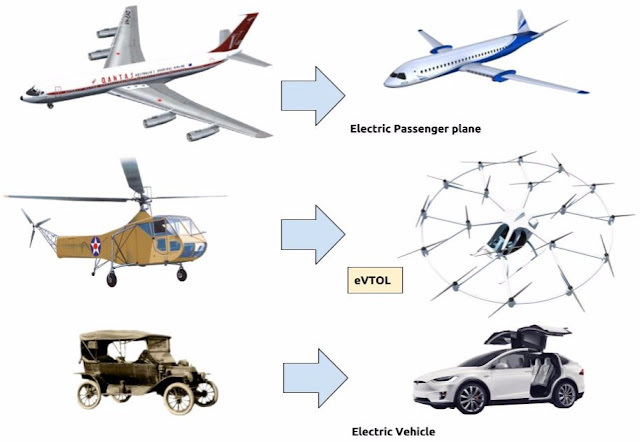 That's in stark contrast to the expectations that surround the eVTOL. If you believe UBER, expect to sell 500-1000 times more than the amount of sales (forecast 2015-2024) of new helicopters for airlifting people, that is if you start with the more than five hundred cities that have over one million inhabitants. Below you can see how each transport mode already has gotten or will have its electric equivalent. The passenger jet has proven to be so successful, that experts predict that it will meet its limitations sometime in the near future, either for environmental concerns (reason why there's already talk of electric passenger planes despite the many issues that battery use raises) or because of aircraft builders, (regional) airports and airline companies making each other’s lives miserable by encroaching on each other’s market share and territory at considerable costs. With the car it’s a bit of the same story, as far as competition is concerned. But it goes further. The automobile has gotten such a hold on consumers and governments over time that it has come to dictate infrastructure and city planning. It has influenced our mobility behavior, living environment, and even our health. That’s where Tesla jumped in, and took the auto industry by storm. Its present stock market value exceeds that of General Motors, despite the fact that its sales numbers are nowhere near that of America’s #1 car maker, profits are nowhere in sight either - a clear sign of how far shareholders and large investors are prepared to go to finance the sort of structural change that would normally be funded by governments. Why think of the driving and the flying bit as separate entities? 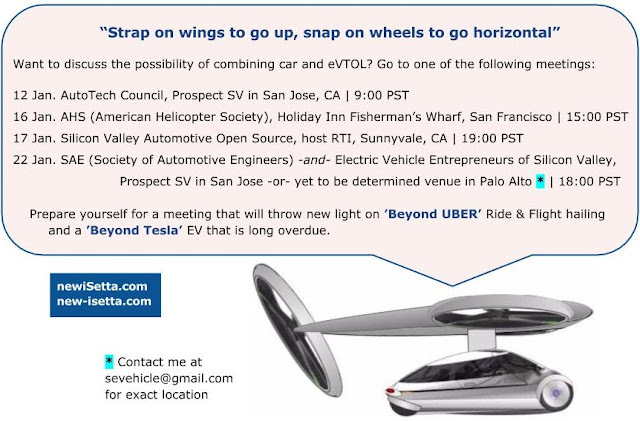 Assuming that authorities will not allow eVTOLs to take and land just about anywhere, this means taking an EV to drive up to the eVTOL, leave the EV, fly to your destination, leave the eVTOL, get into another car. Why not combine flying and driving? People have been fantasizing about the convenience of Flying Cars for ages. There’s a way to utilize the same vehicle, for driving and flying. Since vehicle mass and functions are primary concerns, it is best to use a modular setup. See below. For comparison reasons, I depicted Terrafugia's attempt to fuse the flying and the driving part into one vehicle. The elegant thing of a modular configuration is that either the whole road vehicle gets airlifted or just the fuselage (after which the detachable chassis is left to recharge). Upon landing, either the complete road vehicle unhooks to drive off, and the airfoil + rotors are left to recharge, or the fuselage is connected to an available, fully charged chassis. Plus it still leaves you the option of driving off in a whole other car. Here's where the potentially high-synergetic part begins. When was the last time that the interests of industries, government and users fell together as explained below? When was the last time that aviation inspired the auto industry? Probably somewhere in the 1950s, when cars had tailfins and taillights that looked like jet exhausts. Aviation can now truly inspire beyond the ornamental, and finally 'help' to bring the sort of lightweight, low-drag EV the auto industry will probably never produce without the prospect of making it fly too. Selling a lot of them will automatically bring down corporate emissions - that's the amount of emissions that a car maker that still relies heavily on selling diesel and gasoline propelled cars, churns out. 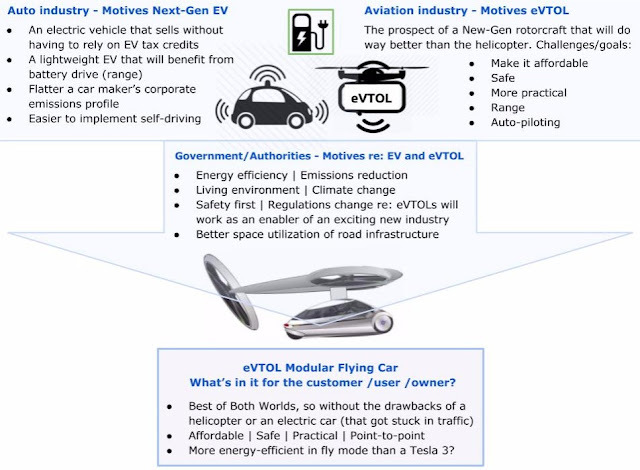 Why and how the eVTOL Flying Car can be tremendously beneficial to both sectors, is outlined below. Transportation Networking Companies (TNCs) can look forward to taking on a larger provider role and having a service grip on the customers that lies beyond an app on their smartphone. Government/authorities can harvest a 'Best of Both': enable a new industry that generates new jobs and all sorts of spinoff innovation -and- do something to stimulate emissions reduction, energy efficiency, popular use of battery-powered EVs without having to issue fiscal incentives, and the more space-efficient utilization of the infrastructure. Think of our roads in terms of bandwidth that is expensive to enlarge. 'We' might even go further. Synergy Aircraft promises a box-wing plane that offers better fuel economy than the average car. It would carry five people and get 40 mpg. 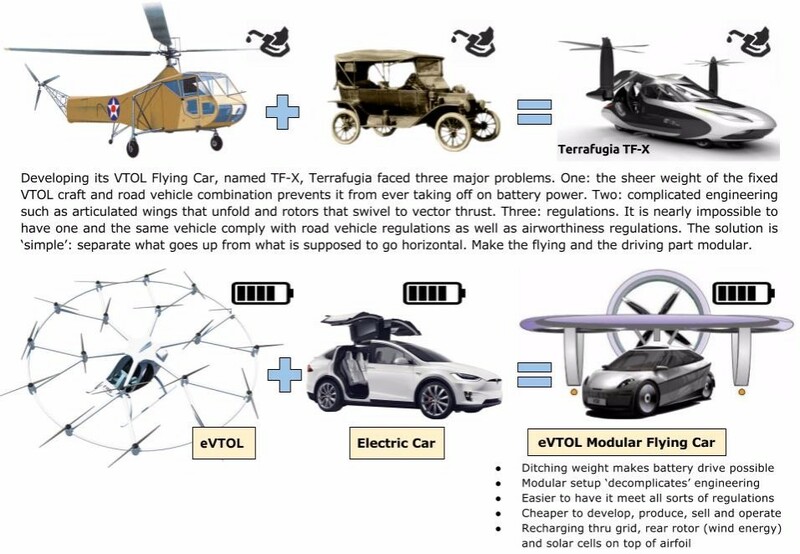 Why not aim for an eVTOL Flying Car that offers better energy efficiency than Tesla's latest electric car, the Model 3? The eVTOL will not only bring three persons faster to their destination, but it will do this while being easier on the batteries than a Model 3 that got stuck in stop-and-go traffic, rendering regenerative braking completely useless for instance.